A privately built manned spacecraft has reached a record altitude of 211,000ft (64km) over California on one of its final tests before officially entering space. SpaceShipOne was built by aerospace pioneer Burt Rutan who hopes to win the Ansari X-prize of $10m (£5.7m) for the first private flight into space. The craft has to reach an altitude of 329,000ft (100km) twice in two weeks to win - and is expected to do so next month. Twenty-five other teams across the world are competing for the prize. Why is the X-Prize so important? In an impressive demonstration over Mojave airport, SpaceShipOne and its carrier aircraft White Knight moved a step closer to claiming the X-prize when pilot Mike Melvill took the vehicle nearer to space than any non-governmental manned craft has been before. 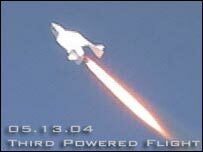 Its 211,000ft (64km) altitude was twice as high as SpaceShipOne had been piloted to previously, and is within striking distance of the height required to claim the X-prize. To win, that altitude - 329,000ft (100km), the official boundary of space - has to be reached twice in two-weeks by a three-man spacecraft. SpaceShipOne's 13 shakedown tests have now put it into a position from which observers expect an attempt to be made within weeks. Burt Rutan's company Scaled Composites has already become the first non-governmental body to be granted a launch licence when the US Federal Aviation Administration gave it one on 1 April. The X-prize will mark a new era in manned spaceflight when private companies are able to make short sub-orbital hops for paying customers. It is hoped that a market for space tourism can be developed but in reality only a very few rich passengers will be able to be carried into space by one or two companies for the foreseeable future.